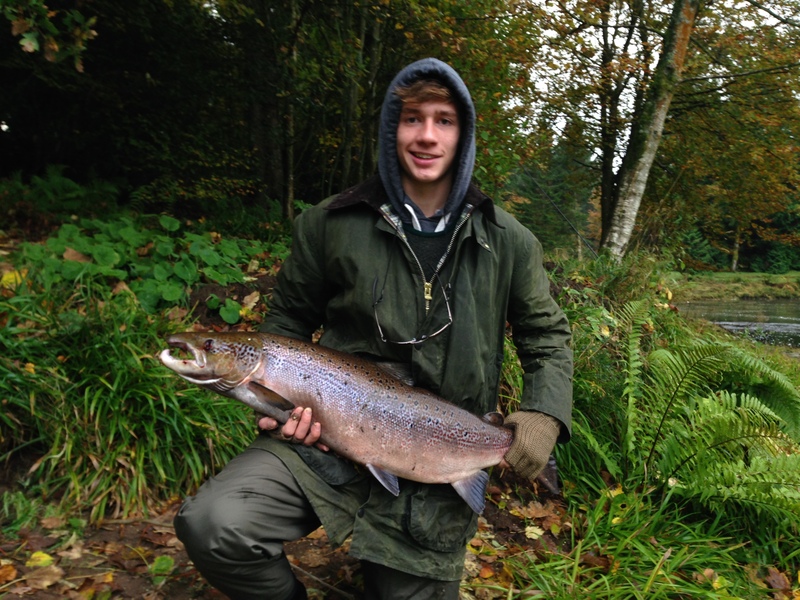 Junior rod Tom, lands his first salmon. Tom Perry-Warnes first introduction to fishing was on the Cree in July. Sadly the fish were not in a taking mood, the result of low water and weather akin to the Mediterranean. So dad Johnny decided that a three day fishing trip at the end of the season to the Nith would offer better prospects to connect with his first fish. During the afternoon of their last day, Tom hooked into a 20lb salmon on the Friars Carse beat. With the expert and calming presence of his ghillie Alan he took 20 minutes to land it. 15 year old Tom is totally hooked and currently planning their next trip to the Nith in 2014.